There’s no denying that Quora is considered the new kid on the block when it comes to killer social media platforms for business owners seeking out the globally conscious demographic. Think of it as the hipper, more enlightened, vegan intellectual cousin of LinkedIn who enjoys meditating, theosophy and yoga retreats. We joke — but actually, Quora wasn’t founded too far off from the core ideals behind this concept. The word ‘Quora’ in fact, comes from the Hindi language and is generally used “in context with paper”. The term quora kagaz in Hindi means blank paper — a term which is surprisingly relevant considering the entire platform is like one big blank slate for ideas, discussion and insights. The platform’s mission statement places an emphasis on bringing together individuals of various communities for thoughtful and respectful discussion on global issues and pertinent personal subject matters. It prides itself on being unbiased, promoting open communication and facilitating a supportive environment. As of the last quarter of 2017, the Quora community consisted of 190 million monthly users — 40 million of which are located in the United States and has an estimated value of $1.8 billion. According to Alexa.com, the vast majority of users on the website are graduate school educated males. So if you’re one of the many individuals or organizations looking to establish and build a presence with this thought-provoking social platform, then look no further than these next few lines. We’ve brought you 9 proven, actionable methods you can implement now to start successfully marketing your business on Quora today. Many times we can get so eager to participate, that we forget to really go the extra mile and familiarize ourselves with common customs, practices and systems put into place. Think of new social media platforms as a foreign land. You don’t just burst onto the social scene in France if you’ve never been to the country before, don’t speak the language and and then proceed to get angry when you’re not accepted or worse, ridiculed for your behavior and ignorance to the culture. The same concept applies to social media platforms. These places are communities. 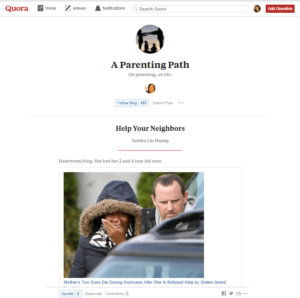 So take your time and really familiarize yourself with the Quora platform’s policies, guidelines and codes of conduct before jumping the gun and ruining your reputation off the bat. For example, did you know that answering questions in a joking manner will cause your answer to collapse? Why? Because Quora places immense emphasis on making sure every page provides useful information. Image-only, video-only and meme answers are also not allowed. The platform also places an importance on transparency, requiring all users to disclose affiliations and can even can knick your answer for poor formatting or grammar. Let’s be honest for a moment — sometimes it’s pretty easy to jump the gun when it comes to tackling a new and exciting social media platform. It can be pretty tempting to just fill out the bare minimum required for your profile or perhaps you don’t even take the time to do that. We’ve all been there. Many of us become so action-oriented and eager for results that we don’t take the time to do things properly. Fill out as much as you can about yourself, your skills, your experience, your affiliations and your business that you can. After all, what’s the point of a profile if people go to it and can’t find anything out about you? I’ve found it very helpful to create a document containing various key points and information on a business, their purpose and achievements so that you have consistent information across various platforms. However, don’t just copy and paste from platform to platform. Tweak the content to speak the platform’s language, fit their tone and attract their audience demographic. For example, on Quora, it’s important to list your experience in the various topics that you follow in order to help establish credibility and authority on a subject matter. It’s also worth mentioning that you should pay special attention to the first 50 characters of your profile because these are used as a tagline of sorts and displayed above all of your answers. Researching popular topics on Quora that are related to your industry is a relatively simple process. In fact, it’s pretty much the same method one uses to look up keywords via Google’s search engine. 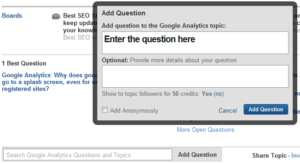 Simply type in a keyword and watch the Quora search engine auto populate the most popular searches with that keyword. Follow Topic – Click the green “Follow Topic” button located at the top right corner. This enables you to have access to the latest activity surrounding the selected topic via your home page’s newsfeed. Email – You can have the latest questions sent to your email by going to your Settings button which pops up after you follow the topic. Once clicked, simply change your email settings to “On”. /RSS Approach – You can also subscribe to popular topics by adding “/rss” to the end of the topic’s URL. Adding questions is perhaps one of the best ways that companies can find out more about their target demographic. To add questions to a particular topic, one simply goes to the topic of selection and clicks on the “Add Question” button. Once the question is posted, individuals will begin to post answers to your inquiry. 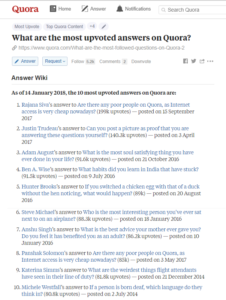 In the event that you’re not getting the answers you need (or any at all), Quora also has a system in place called “Ask to Answer”, which basically allows you to ask specific Quora members to answer your post. This not only gives you the ability to pick and choose whom you would like to gain further insight from, but it also gives you the ability to build strong connections and networks. One last thing — gratitude is of paramount importance — especially on Quora. If individuals take the time to respond to your question — be sure to thank them kindly. Trust us when we say it goes a long way. Submitting answers to relevant topics is a great way to promote yourself and your business on Quora. It’s important to remember that shameless self-promotion and traditional advertising techniques are a total faux pas. This is advertising of the past and the future is in developing and maintaining organic connections with your audience while establishing yourself as a conscious organization. Answer questions to spread awareness, build up your brand, establish credibility and cement yourself as an authority figure in your industry. When answering questions, be sure to provide detail, insight and bring something significant to the table such as a unique perspective or approach. Formatting and grammar are also extremely important and in fact, neglecting to take careful attention to these factors can result in your answer being collapsed. So take the time and do it right. This gives you the opportunity to create a collection of your favorite content both on and off the platform. Think of Quora boards as pretty much the same exact thing as Pinterest boards. With boards you can organize your favorite questions and answers, as well as curate content from other websites on your profile. Even better is the fact that you can also facilitate engagement on your board by allowing submissions from other users. Most individuals and organizations find boards extremely beneficial for the purpose of cross-promoting relevant and valuable content to Quora users via their own personal boards, or the boards of others that are open to submissions. Quora offers advertising options for businesses looking to make a greater impact on the platform. 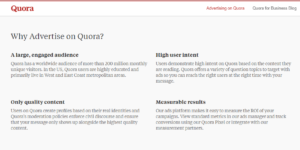 With Quora’s Ad Manager, businesses are able to create campaigns, ad budgets and enjoy the benefit of only having to pay for results. Many businesses such as Shopify, HubSpot and Udacity have found success in this approach. However, just because you can advertise, does not mean you an shamelessly self-promote your brand. It’s annoying. Point blank. There’s nothing worse than a company that is constantly pushing an agenda on an audience looking for organic connections. Today’s consumers are far too intellectually advanced and tired of this approach. While Quora is indeed a platform that is great for spreading awareness, building your brand and establishing yourself as an authority presence, you have to do it the right way. So keep your profile updated with your current contact information, website and other forms of content so that users looking to learn about your company don’t have to practically trek through the Amazonian jungles of Quora to do so. Add links when relevant and ONLY and contribute more than you make “asks”. However, with all of this in mind, don’t be afraid to choose the advertising options, ad relevant links to your personal website or content when they are of additional value, or encourage others to follow you on Quora using the “Follow Button”. These methods are totally acceptable — just don’t go overboard. Take this mission into consideration every time you go to post questions, answers or content on the platform. Quora values high quality, thought-provoking questions and answers. They value content which address global issues, explains world events and guides others in important life decisions. As a result, detailed answers and questions offering unique perspectives, approaches or solutions are key. Quora also prides itself on objectivity. The platform insists there is no “left wing version…right wing version..western version…and eastern version” of any topic or idea that is posted. Quora is a platform for voicing opinions and bringing together individuals across different communities. So bring value consistently and you will be consistently rewarded for your diligent efforts. To sum it up succinctly, views are great, upvotes are better (they show support and help boost your content rankings) and shares are the best. This is a pretty straightforward approach and you’ll notice these metrics parallel nicely with those of other platforms for less ambiguity. 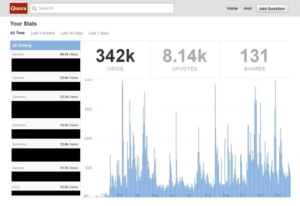 Users are able to view stats for the questions and answers the post, the blogs they write and all other content that they contribute to the platform. Crazy Egg has a great breakdown of ways in which users can analyze their stats such as by clicking on their number of views to see how readers are being directed to your content (i.e. through your profile, topics, browsing). Quora has become a pretty big deal since its original inception as an unknown back in 2010. Since then, it has grown to become one of the most popular social media platforms, with almost 200 million users worldwide. The platform is a great option for those looking to spread awareness, build a presence or establish themselves as industry authorities in a given niche. However, it’s important to keep in mind that the Quora community prides itself on the fundamentals of inclusion, universal access to knowledge and facilitating a supportive space for global discussion. Businesses looking to make an impact would be well served to participate in the intellectual platform as long as they play by the rules and bring value to the community. So, if you’re looking to make an impact in this social sphere, then keep in mind our 9 strategies for effectively marketing your business on Quora today. What are some tactics you’ve used to successfully market your business on Quora? We’d love to hear your input!